I have found myself, of late, pondering birthdays. This is undoubtedly because my own is fast approaching, and will arrive in a whopping 10 days. My emotions are mixed about this one, several-fold. I will be turning 36. This does not bother me on a daily basis, but occasionally I find that it completely squicks me out, the very same as turning 26 did, a decade ago. 25 and 35 had no ill effect on me. But those years after that midway point? Back then, it was, “Holy crap, I’m now on the downhill slope to 30! GASP!” Now, I will be entering the “downhill slope to 40.” Can you believe it? I can’t. So while it does not bother me all of the time, and when it does it is not completely earth-shattering, it is still a shock. It is also on my mind that I would feel ever so much better if I could go out and do something fun about it. However, my and J’s work schedules never line up. Ever. Which means that the opportunities to go out and do something, either with friends or just together, are slim. I will enjoy some celebratory things with the fam at home, in and around work shifts, which will be lovely. And J and I will scrape together at least some small stolen time to go out and have a toast. Never mind that I was, earlier this year, very much looking forward to having some good New Orleanean birthday fun this year. After this year, I’ll have more New Orleans birthdays than I can keep up with, I am certain. And I simply can’t get myself too overly riled up about my birthday being fairly simple and calm this year, because J had it worse, back in March. And this, my friends, leads us to this week’s Monday Menu: Cafe du Monde, and Birthday Beignets. See, back in March, J and I were rather focused on packing and loading and hitting the road, hope in our hearts and dreams in our eyes, for New Orleans. Because of this, his own birthday was nearly forgotten (especially by me that Monday morning before we flew da coop. Bad wife!) save for love from the fam and, later, some toasts on one of our last nights with pals. Poor guy. I felt so bad. However, on the way outta town, I promised him that we would, upon our arrival in New Orleans, go and get him some Birthday Beignets, by golly! Sigh. Time passed. We were so intensely focused on job-hunting and trying to get some roots dug into the mud, that it didn’t happen right off the bat. And didn’t happen. And didn’t happen. Never mind that, in our FQ strolls, we would walk past Cafe du Monde all. The. Time. HOWEVER. Before we left town for our brief (and now almost-over) Colorado exile, we went and, at long last, J got his March Birthday Beignets. In June. Opinion seems to vary about Cafe du Monde, the website for which can be seen HERE, GO HERE! Situated between Jackson Square and the river, in the French Market, this good ol’ coffee stand has been open since 1862. They never close, ever. Except for Christmas Day, and for the occasional Hurricane Event. I have never seen a photograph so eerie in appearance, at least recently, as a couple of shots that I saw of a closed and empty Cafe, in lieu of Hurricane Isaac. Wild. At any rate, the varying opines seem to meander back and forth between whether it is yet another touristy joint that inspires bane and avoidance, or a wonderful historic New Orleans INSTITUTION, man, where one can eek in past the line (that I keep hearing isn’t something to be regarded), find a table, and get some good cafe au lait and a plate of 3 beignets that will divinely transport one to a sugary french-donuty paradise, all while people-watching and listening to the guy playing saxophone just outside the cafe’s entrance. J and I fall into the latter category. 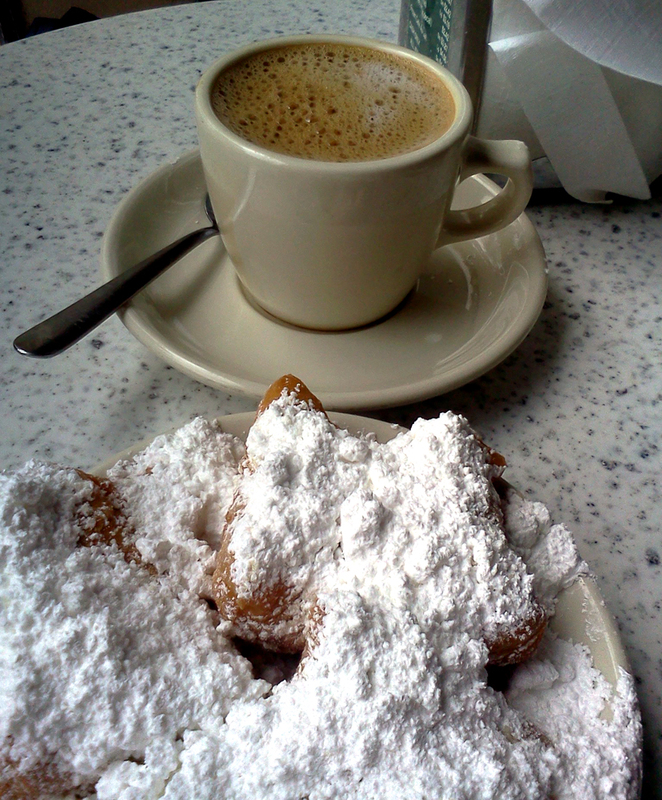 We have to be in the right mood for it, of course, but Cafe du Monde is, in our opinion, certainly NOT a place to be avoided. Go there, go there now! For whatever reason, I can never eat three whole beignets. Sacrilege, right? I can’t help it, my sweet tooth is just moderate. This does not mean that I adore them any less. It just means that I share. This is what J and I did that day, got one plate and shared it. I love dumping the powdered sugar into my Cafe au Lait. Does anyone else out there do this? I would love to know. 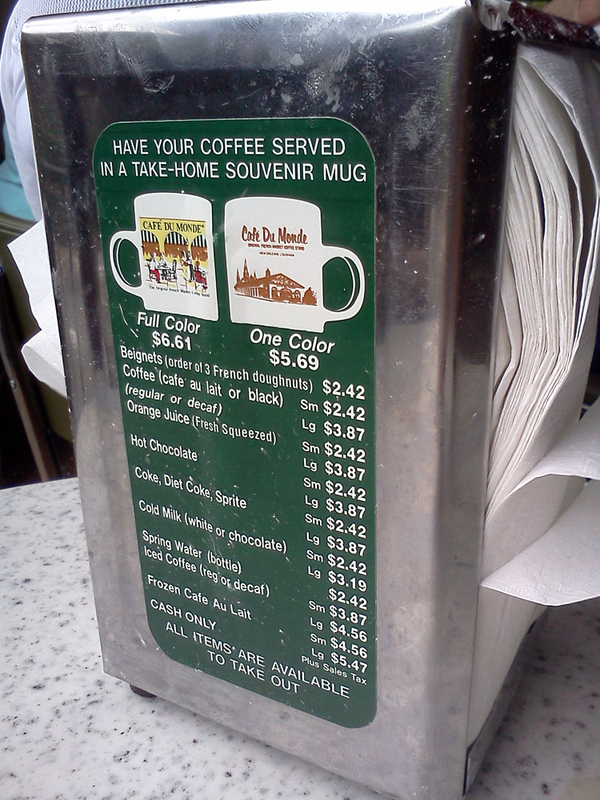 Cafe du Monde is, interestingly, one of my earliest memories. I recall being very, very small, and being there with my parents. For some reason, I seem to remember feeling awed by the fact that Making a Mess was a-ok in this joint. See, making a mess is unavoidable, here. Happening to be attired in black also seems unavoidable. One of the magic tricks is to, upon arriving and nabbing your table, get a feel for which way the river breeze is a’blowin’. And then establish yourselves so that not a single soul in your party is downwind from the powdery and glorious concoctions. Easily done, when there are only two of you. A larger group than that? Good luck! Just get messy, it’s part of the fun. On J’s Birthday Beignet day, the two of us came out rather unscathed. My purse, though, did not. As you can see. Feeling sentimental, I just let the fluff waft onto my belongings. And then I rubbed it in and carried it all the way back with me. It has since all rubbed off, but it was cool for a while. Not in the mood for a crowd? You can also get your goodies to go. Snagging your beignets and taking a brief walk up to the river and munching them on a green bank by the Mississippi also makes for a most wonderful moment. Just eat them sooner rather than later, beignets are best fresh. In summary? I love this place, just like I love very, very many things in New Orleans. So go, flow with the crowd, feed yer face, and get sugary. Enjoy the lazy ceiling fans and the river breeze and the sax-man and how things echo under the canopy. I think I hereby proclaim Birthday Beignets to be an official tradition for us. J’s, mine, the folks, friends who come visit us for THEIR birthdays. Yes! Birthday Beignets! Make it so. Well, after this one, of course. Sooz, I’ve never dumped powered sugar into my Cafe au lait but, since you’ve brought it up..now I’ve got to try it! You’ve totally gotta try it! It doesn’t sweeten it as much as normal sugar, but it’s just different! 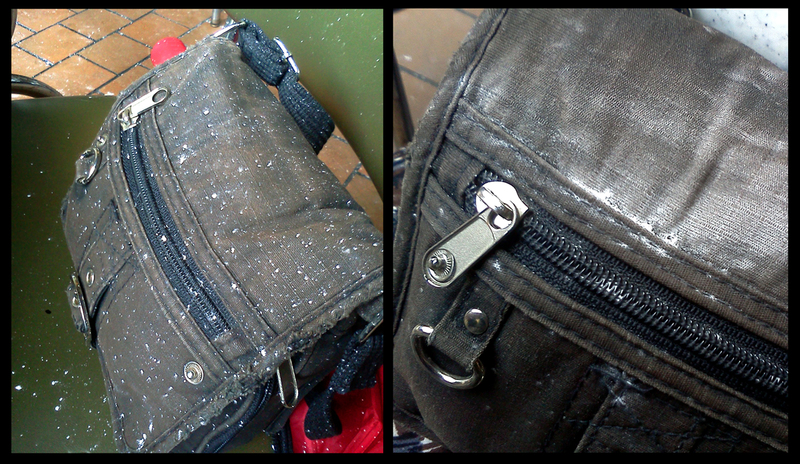 I always figure they give you SO MUCH powdered sugar, that I have to use it wherever I can, haha!